+5°/-20° Pitch, +/-10° Roll, 360° Yaw (when attached to an extension column), +/-15° Yaw (when flush mounted), which enables the image to be perfectly aligned with the screen. Mount completely pre-assembled to save you time. Independent roll, pitch, and yaw adjustments provide easy image alignment. Can be mounted directly to a single wood beam or concrete slab without disassembling the mount and without reinforcing the ceiling. Can attach to 1 1/2" extension column, 3/4" extension column, or 3/8" threaded rod. Armor Lock security screws pre-installed for a secure installation in minutes. Quickly release the projector for maintenance with the simple turn of a knob. Built in cord management access hole provides complete access to route cords through extension column to keep cords hidden. 4 adjustment points allow a quick, simple installation. Final security lock down is optional to use. Easily and quickly attaches to clamp-style universal adapter plate. Universal clamp designed to hold projectors either inverted or upright. 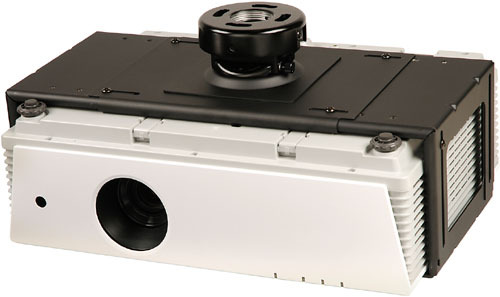 Ideal for projectors that do not have mounting holes or cannot be inverted. Large side openings in clamp provide access to projector ports (It is the responsibility of the installer to check the vents and ports on the projector to ensure that they are not obstructed by the universal mount. Blocked vents may cause damage to the projector). Low profile allows the projector to be close to the ceiling. Offers the fastest installation to reduce installation time and costs. 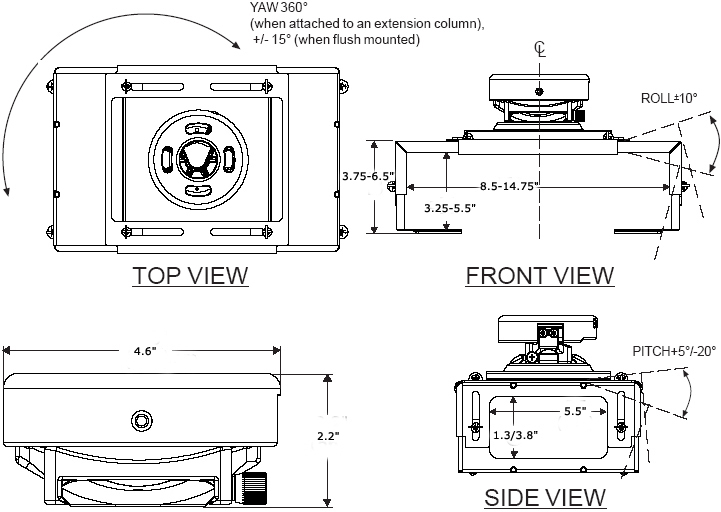 The PRS Series Clamp-Style Universal Projector Mount is the most low profile universal mount available today. It offers a quick and easy installation in addition to unmatched versatility. The mount ships preassembled, can be attached to any common ceiling structure, and is offered in multiple colors to complement any setting.